Internet is a huge place where we share information. We often exchange information over insecure channels or networks. Email services and IM clients are often tracked by the respective vendors for user information and activity patterns (user data is often tracked by Facebook, Google, etc.). This may cause serious privacy issues for the users and they might be reluctant to share important information via SMS, email or other such services. To protect your privacy from being tracked by vendors, you can try sending information in an encrypted format. The encrypted message can then be decrypted by using the correct password/key. This method still has some security holes. The encrypted message continues to exist even after the purpose has been served , and one can use brute force or similar attacks on it to find out the actual message. Due.IM has come up with a simple, yet innovative measure to handle this situation. The website encrypts your message but it can be decrypted only once. If the message is not decrypted within 24 hours, or once it has been successfully decrypted, the message is permanently deleted from the server. So basically, the message can be viewed only once on the other end. The product is named One Time Share, which comes from the fact that messages can be shared only one time. 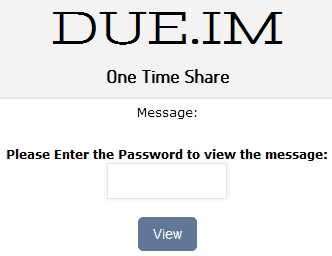 One Time Share uses a simple and easy-to-use user interface. It uses a 128 bit SSL encryption to transmit data securely. Data is also stored on the server in an encrypted format, so that the vendor is not able to track your stored message. 1. Open Due.IM. By default, it opens the One Time Share page. If it does not, click on the “One Time Share” link on the Home Page. 2. Enter the message you want to share, in the first text box. 3. In the second textbox, provide the one time password you wish to use for encrypting the message. 4. Click on the “Create One Time Share Link” button. A link will be generated by the server. Forward this link to the person you wish to share information with by the help of Email, IM, or any other mode you like. 5. Share your one time password with him/her through a different channel/network (telephone, maybe?). It is always recommended to send message and key separately for security purposes. 6. When the person on the other end receives your link, he will be prompted to enter the one time password. The message is visible only when the correct password is provided. At the same time, the message is immediately deleted from the server and the link becomes invalid henceforth. So no one can use the same link the second time even if they know the password. 7. The message is automatically deleted from the server if the link has not been opened for more than 24 hours. This is to increase the security of your message. One Time Share is a simple yet secure way of sharing information over the Internet. Visit Due.IM and start sharing your secret messages securely.